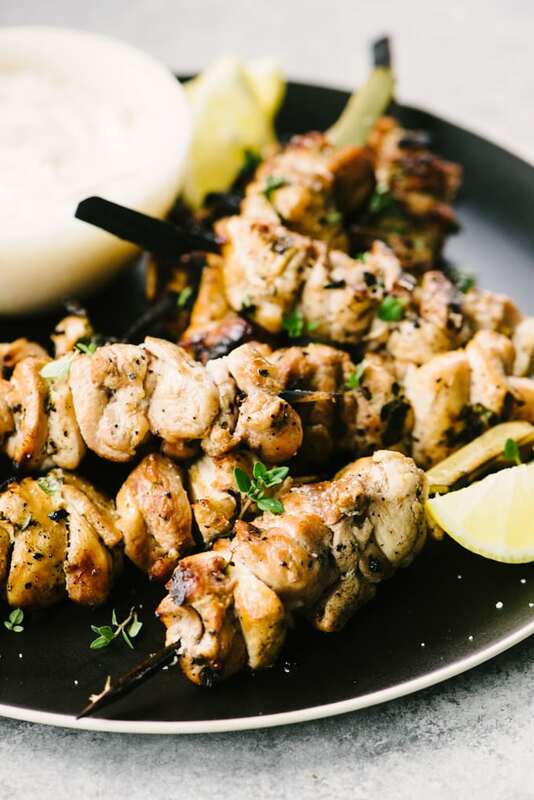 These lemon thyme chicken skewers have quickly become a seasonal favorite! They’re easy and flavor-packed, totally kid friendly, and perfect for weeknight dinners, picnics, summer parties, and so much more. Serve them with lemony yogurt dip for a crowd-pleasing combo you’ll want to nosh on all summer long. School’s out tomorrow and I am so ready to get my summer chill on. We did a practice run of super lazy times last night, and I’d rate it 9/10. I packed a picnic dinner with grilled sausages, sliced veggies, a bag of cherries and some cheese and carted the kids off to the pool for an evening swim. I only docked a point because I wasn’t allowed to bring wine. 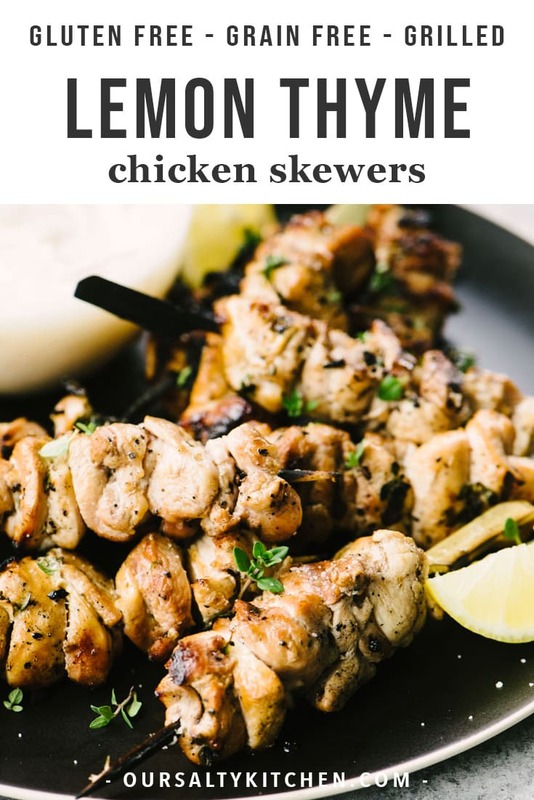 Lately my daytime hours have been spent dreaming up easy, flexible, and preferably portable dinner recipes to have on hand for all of our summer eats, and I have to say that these lemon thyme chicken skewers completely exceeded my expectations. First of all, these skewers taste AMAZING. The lemon and garlic soak into the chicken, getting it all tart and juicy and tender. And then you grill them up and it’s crispy bits nirvana. Crispy AND juicy? YES. Who needs fried chicken when you have these guys? I have about eleventy billion reasons to be making these guys all summer. They’ll be joining me at the pool, on the patio for weeknight dinners, and they’ll definitely be making an appearance for Fourth of July. You wanna make ’em too? Of course you do. Let’s go! Pin it now! 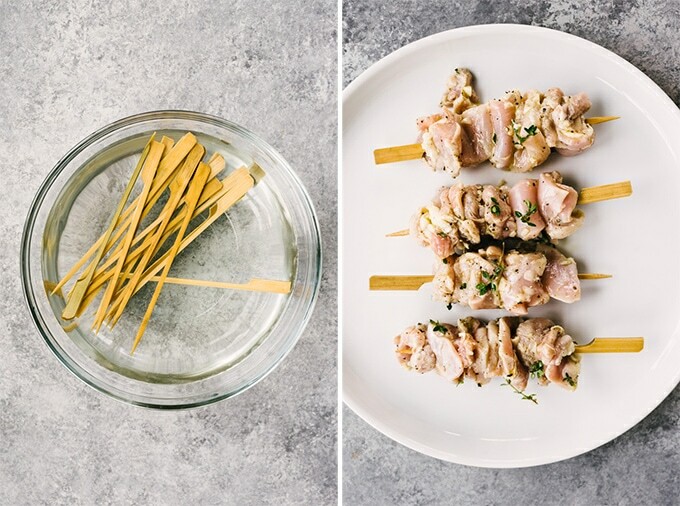 Click here to save this recipe for Lemon Thyme Chicken Skewers to your Summer Recipes Board on Pinterest. Food on a stick is always a summer winner, and even better when it’s easy, fast, healthy, and delicious. 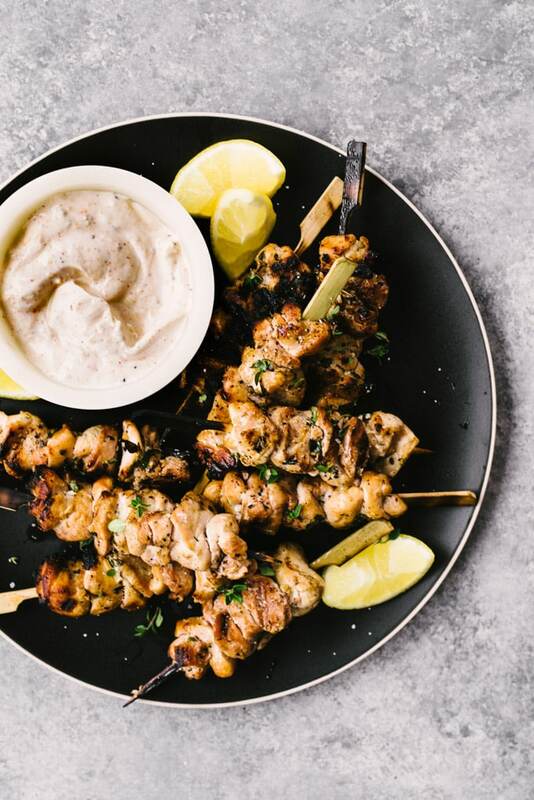 You can prep these skewers in just 10 minutes, and they grill up in less than 20. 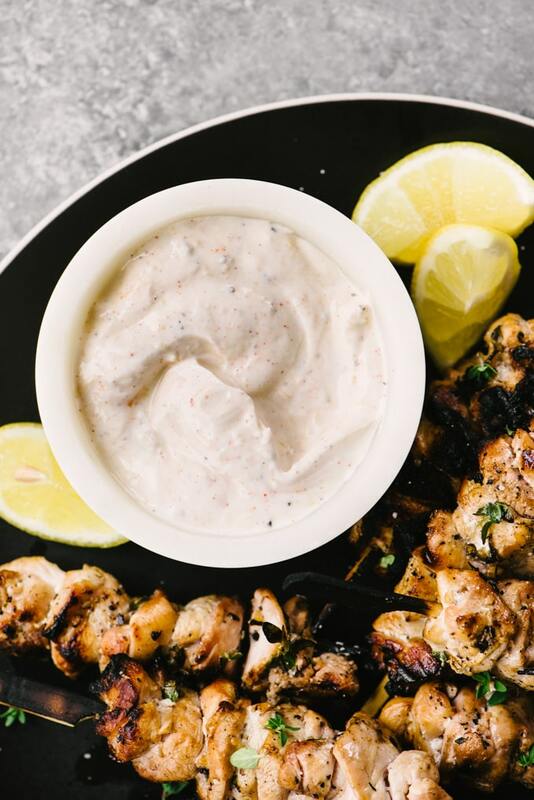 While they’re getting all crisp n’juicy on the grill, do yourself a favor and whip up the accompanying greek yogurt dipping sauce. The two are the dreamiest of summer food combos, and I like you, so I wouldn’t want you to miss a single bit of flavor. 10 minutes. Seven ingredients. Let’s do it! Garlic, olive oil, lemon juice, salt and pepper. Yes, yes, yes. Go big on both the salt and lemon juice – they’ll brine and tenderize the chicken, resulting in super juicy chicken skewers. 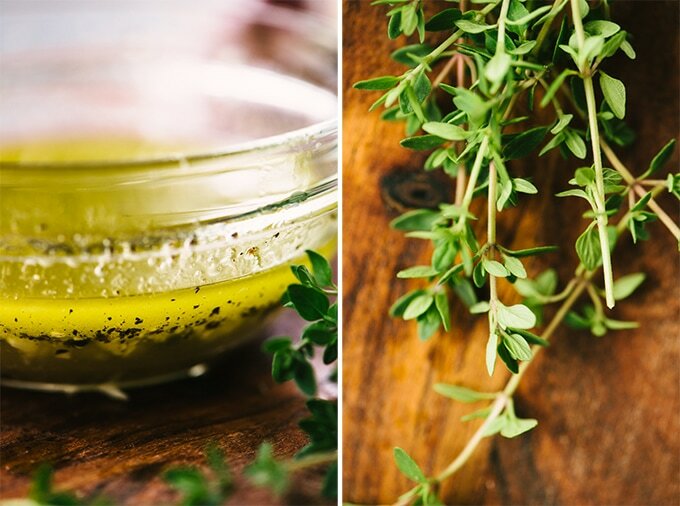 Whisk up the marinade and then chop a large sprig of fresh thyme. Hang on, we’re almost there! I use boneless skinless chicken thighs. Thighs are fattier than breast meat, which adds flavor, and has more connective tissue, which keeps the meat juicier. Dice the chicken thighs into equally sized pieces of about an inch each. Keep the size uniform so the pieces cook at the same rate. 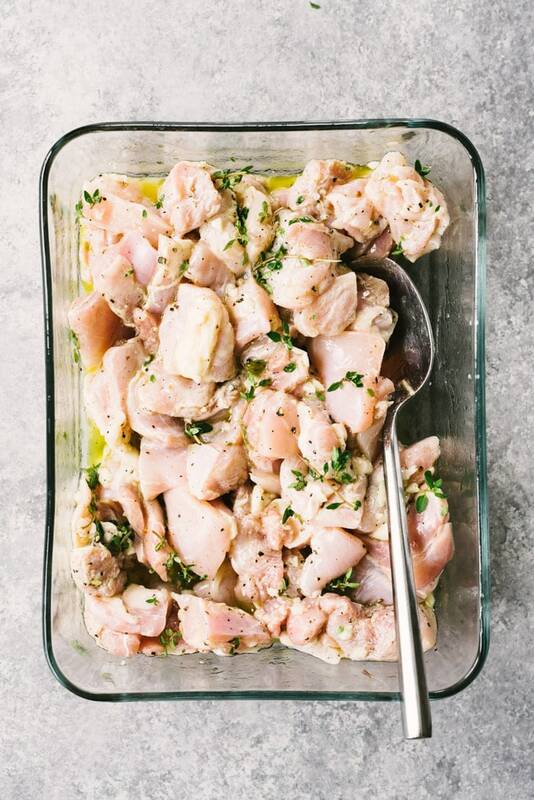 Toss the chicken with the marinade and chopped thyme. Cover, then let it hang out in the fridge for at least a few hours for best flavor. About 20 minutes before you’re ready to party, fire up the grill and then soak the skewers (if you’re using wood skewers). Soaking them in water will help prevent the skewers from burning to a crisp over the grill flames. Grab your marinated chicken pieces and thread them onto the skewers. Pack them together closely, and rub any residual marinade into the chicken. Grill the skewers over high heat, turning every few minutes, until cooked through. 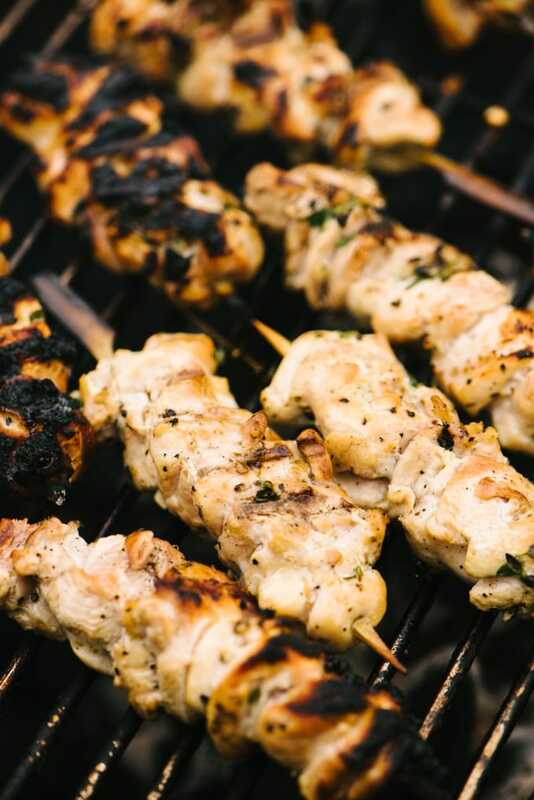 If you notice that the outsides are charring too quickly, move the skewers to a cooler area of the grill to prevent them from completely burning before the insides are cooked through. The skewers are done once they reach an internal temp of 160/165*. I use an instant read thermometer to test for doneness, and it’s the best under-$25 investment I’ve ever made in my kitchen. No more second guessing yo’ chicken! 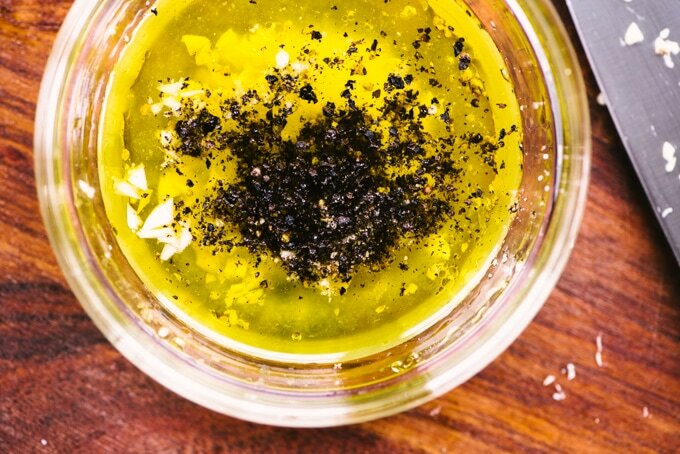 Take five minutes while the grill is heating up to make this yogurt dipping sauce. Greek yogurt, lemon juice and zest, a little mustard and paprika, and a LOT of flavor. It’s awesome-sauce. Do it! And now we dip. You dip, I dip, we dip. Go easy on yourself and have these lemon thyme chicken skewers with fresh melon, and a tossed salad for dinner. If you’re feeling adventurous, grill up some corn alongside the skewers and serve them with my favorite grilled corn salad. Looking for more easy recipes to please a crowd? Try my steak skewers with dipping sauce trio, basil-packed no mayo potato salad, or this show-stopping peach panzanella. 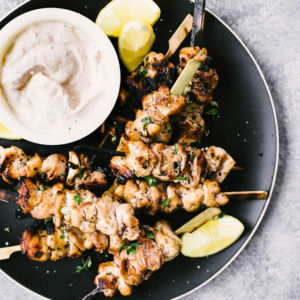 DID YOU MAKE THESE GRILLED CHICKEN SKEWERS? I WANT TO SEE YOUR CREATIONS! SNAP A PICTURE AND SHARE IT HERE ON PINTEREST. Whisk the olive oil, lemon juice, garlic, salt, and pepper. Pour the marinade over the chicken pieces, then sprinkle the chopped thyme onto the chicken. Toss to coat evenly, then cover and chill at least 2 hours and up to overnight. Combine the greek yogurt, lemon juice, lemon zest, ground mustard and paprika in a medium sized bowl. Whisk until combined. Taste for seasoning and add salt and pepper if needed. Refrigerate until ready to use. Alternatively, prepare the dip just before serving. When you are ready to cook, heat a grill over high heat. If using wooden skewers, place them in a bowl of water to soak for 10 minutes. Thread the chicken onto the skewers, then baste with any remaining marinade. Grill the skewers over high heat, turning every 3-4 minutes until charred on the outside and cooked through on the inside. Test for doneness with an instant read thermometer - the skewers are ready when they hit an internal temperature of 165*. If the outsides are charring too quickly, move the skewers to a cooler section of the grill to ensure the outsides do not burn before the insides are finished cooking. 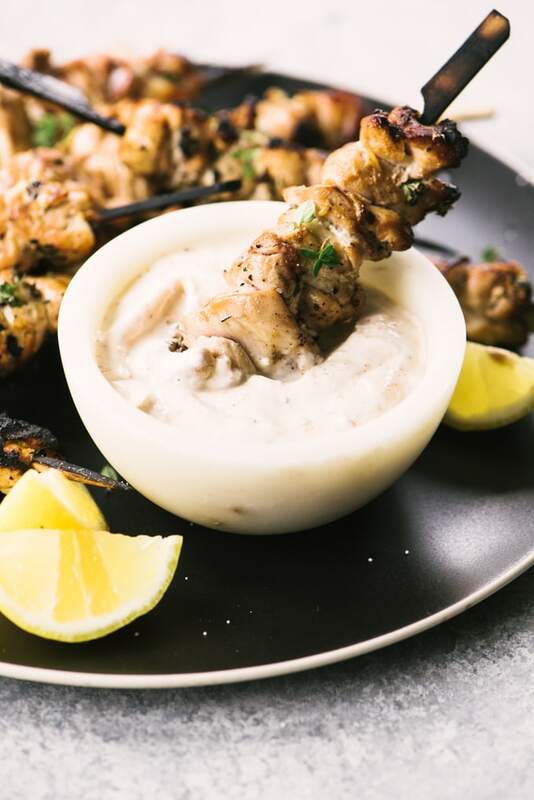 Remove the skewers from heat and place on a platter with the yogurt dipping sauce. Squeeze with additional fresh lemon juice and sprinkle with fresh thyme. Serve immediately. The skewers will keep in the fridge in a sealed container for up to 5 days. Reheat by removing the chicken from the skewers and sautéing in a cast iron skillet over medium heat. I’ve been eyeing your chicken shawarma recipe for a while and this recipe looks like another one I need to make ASAP! They look SO delicious!! I shouldn’t comment on food blogs when I’m hungry haha. Sweet! We’re having a BBQ this weekend and guess what I’ll be making??! Oh, my. These skewers look mouthwatering and almost lunch time at my side. Love the pictures. Ooh, these skewers look delish! I love the photos, the chicken looks so flavorful! I’m putting this on the menu for 4th of July! Beautiful pictures! This looks really good! This grilled Lemon Thyme chicken looks amazing. I definitely think my entire family would enjoy chicken cooked this way.